The Future Today Institute's research and tools are now open source and licensed under a Creative Commons Attribution- NonCommercial-ShareAlike 4.0 International License. 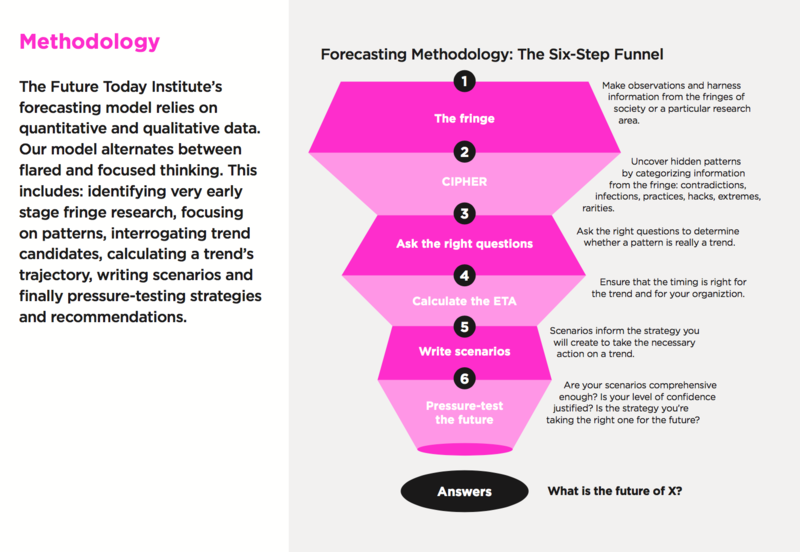 We have spent more than a decade researching, modeling, testing and refining the Future Today Institute’s forecasting methodology and tools, which are used in hundreds of companies and government agencies and as part of college courses all around the world. Part of our mission at the Future Today Institute is to democratize the tools of futurists in order to empower everyone to actively plan for tomorrow. To that end, we make some of our strategic thinking frameworks and tools freely available to enable anyone to create their own preferred futures. Our futures forecasting methodology relies on quantitative and qualitative data, and it has six steps. Our model alternates between flared and focused thinking. 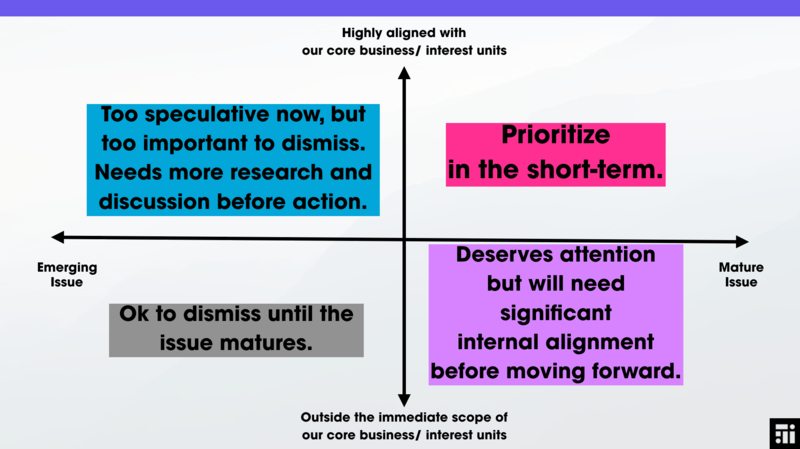 To effectively plan for the future, organizations need to learn how to swim in different lanes simultaneously, and to think across a spectrum of time. 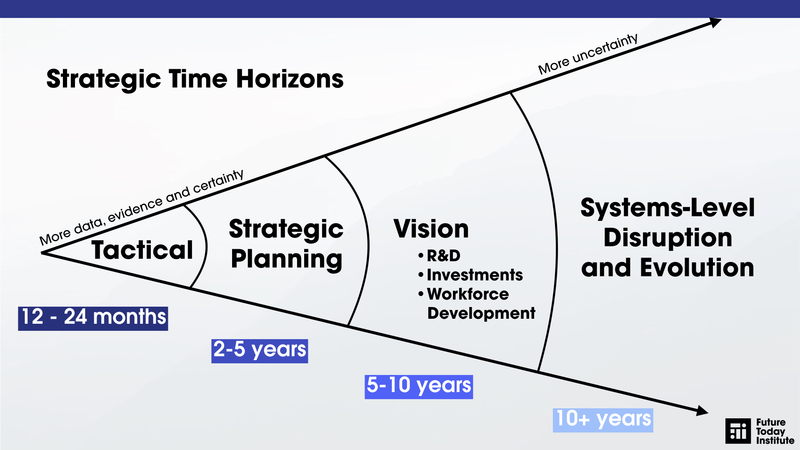 For any given uncertainty about the future — whether that’s risk, opportunity or growth — leaders must think strategically about tactics, strategy, vision and systems-level change. 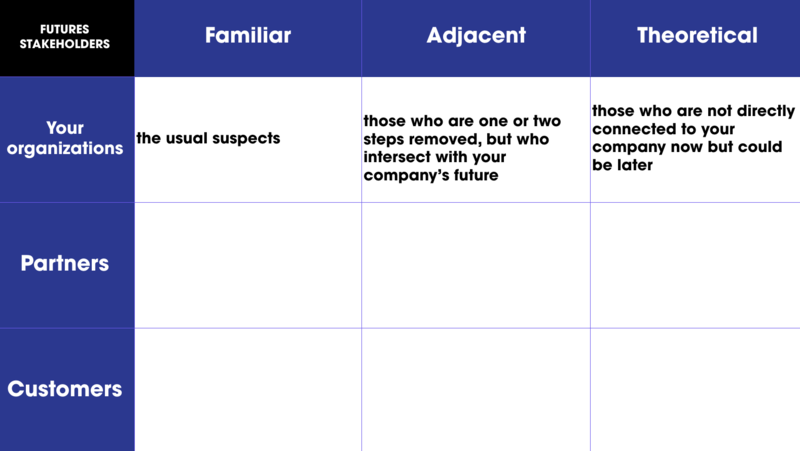 Leaders and teams should work methodically to identify every possible stakeholder using proximity as a guide. When FTI works with organizations, we always begin with the following exercise. This matrix guides analysis on how to take action on an emerging technology within organizations. This framework is used when discussing emerging technology, risk and scenarios. It guides conversations when making decisions about the future. Technology does not evolve on its own, in a vacuum. Even the most forward-thinking innovators are still grounded in reality, tethered to other areas of society. Trends are subjected to and shaped by external forces. Just as it’s useful to organize our thinking along a chronological path through time zones, it’s important to categorize the various dimensions of our everyday life, with technology as the primary interconnector. 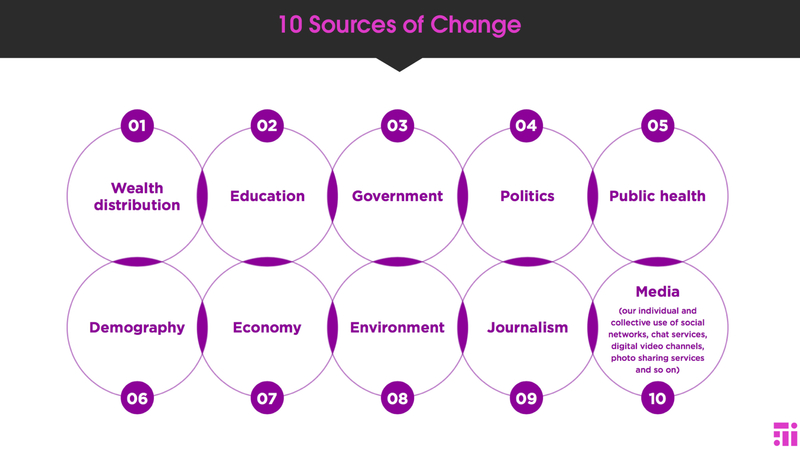 In order to forecast the future of anything, you must listen for signals across these ten sources of change. Download this strategic thinking framework. 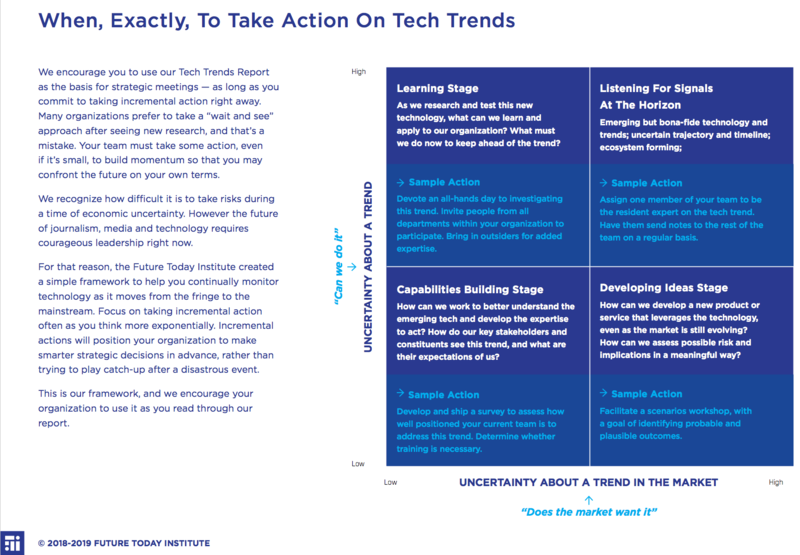 The FTI Trend Impact Matrix helps determine what action to take on an emerging trend. Use it to take incremental actions. Which mode is your organization in? Not all foresight and strategic planning work fits the same purpose. 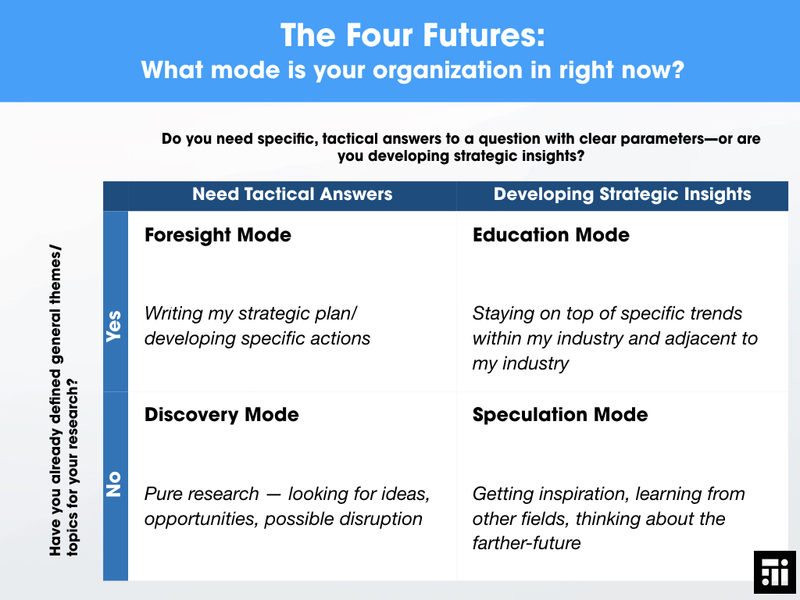 Determine which of the Four Futures your organization is in before starting your work. Is your organization planning to build an AI-powered chatbot? You must plan in advance for the future for voice recognition and speech. When developing your bots, we recommend that you rate your bot using the probabilities of future problems before deployment. Use this scale to rate your bot on its impact—and to determine, in advance, whether or not you’ve accidentally encoded bias into your system. Rate your bot on a scale of 0 - 10, with 10 being the highest (and preferred) score.